To extend research based knowledge and information on home horticulture, pest management, and sustainable landscape practices to the residents of California and be guided by our core values and strategic initiatives. The UC Master Gardener Program is an educational and public service component of the University of California Cooperative Extension (UCCE) program. For more than 100 years, UC Cooperative Extension advisors and specialists have worked with local businesses and governments across the state to address agricultural and natural resource issues. The UC Master Gardener program was started in 1981 to extend research-based knowledge and information on horticulture, pest management, and sustainable landscape practices to the HOME gardeners of California. 50 UCCE county offices now offer a UC Master Gardener program with over 6,000 active members. 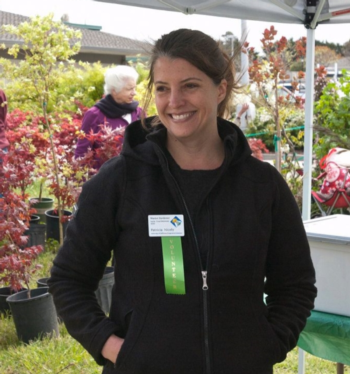 UC Master Gardeners offer local educational programs for home gardeners that include gardening Hotlines, workshops, presentations, demonstration gardens, information booths, and much more. UC Master Gardeners come from all walks of life and with a broad range of experiences and skills. They share several characteristics: a passion for horticulture and environment, an eagerness to learn, and a desire to serve their communities by supporting the outreach efforts of the University of California and its collaborating partners. UC Master Gardeners of Monterey Bay was formed in 1995 to provide home gardening education in Santa Cruz, Monterey, and San Benito counties. Since then, we have trained over 200 UC Master Gardeners who have then provided thousands of hours of educational services to local gardeners through our Hotline, public information booths, events, community and school gardens, workshops, classes, and much more.